I've bought myself some white flowers as a potential subject for the upcoming floral exhibition. I've heard a few comments that the flowers on our kitchen table are perfect for the season, we've been getting lots of ice and snow. I'm busy working out a composition that I'll develop into a finished oil painting. We just received the February edition of the American Art Collector magazine and we're really enjoying the issue. The magazine features some great work including an article on our friend and colleague, Joel Carson Jones. You can see more of his work on his website: www.joelcarsonjones.com. Long ago alchemists turned base metals into gold. At least this is the myth of the alchemist. Today we can make diamonds in the laboratory. The long ago dream of transmutation is now a reality. Is this alchemy possible in art? I think it is. It is the aspect of art that is not understood by most people who go around calling things art, which surely must be called craft, and not art. I will get to this point later. Imagine a music composer walking to a river and taking in sounds of rushing water. Bird songs accompany the sounds of wind blowing through tree leaves. Our composer is aware of the sound that nature provides during his walk. His footsteps keep a rhythm he can alter. The walk to the river has provided our composer with a group of sounds he can later recall and recreate altering, expanding, doubling, or whatever he wants to do to his memory of the walk. He can sit down at his piano and begin to create a musical composition based on his walk He brings to his creation his talent and his ability to bend, distort, enhance, and manipulate what he has in his mind and create music that he will call ‘A Walk to a River’. Has our composer done something magic? Has he used alchemy to turn something into something else? Has he found gold at the end of his work? The answer to these questions is yes. His mind altered the perceptions that stimulated his imagination to create. He is the alchemist working the magic. The man performing this alchemy is the vehicle that first received the stimulation from out of him. The man was then able to let the memory of the experience come through his body and out his hands as he tried this and that combination of sounds on a piano. Harmony, rhythm, beat, and all his tools as a musician help him put together a musical composition that he made possible using his abilities and talents. He is a musical alchemist. He did not use a tape recorder to play back his experience later. He did not use a camera to photograph the sights at the river and later see the photographs in order to remember the visual images hoping to be stimulated to enhance his musical piece. He used his mind to remember the world from which he took what he needed and discarded what was superfluous. He permitted the walk to the river to alter him as a person and with his rendering of that experience; he is now able to give us the final production with his music. Now let us think of a painter having a similar experience. Is a painter able to match the musician? Is a painter able to be stimulated by outside influences that create in him a desire to recreate the experience? Is a painter as strong an alchemist as a musician? The answer is yes and let me tell you why. When a painter sees something that caches his eye, he remembers the information as did out musician. The light falling on the objects the painter sees comes into his eyes and is transformed into data the mind can read. Light penetrates the painter taking color, shape, tone, intensity sharpness, warmth, distance, perspective, and all elements that the eye can and does let into the painter’s mind. In the painter’s mind the painter then alchemically, doubles, enhances, tones down, intensifies, colors, diminishes, expands, and all other changes the painter is endowed with in his craft to recompose his experience that came to him from the outside. He magically lets this information come through him by using his hands at the easel. Line, mass, color, tone, shading, highlighting, glassing, scumbling, scratching, varnishing, and all a painter knows how to do come to the painter’s aid in order to let the painter become the alchemist and allow him the ability to change base metal into gold. If you know anything about alchemy, you know that the change takes place in the alchemist. Our musician and our painter have found a way to change something into something else. The truth is that the musician and the painter have changed themselves. They are now the gold they sought. The music as well as the painting are nothing more than a byproduct of the real transmutation that took place when the information taken in by our artists went through the artists and came out as creations we all can now sit back and enjoy. Now I want to come back to the difference between an art and a craft. Our musician and painter have one thing in common. That alchemical change took place in the artist. A sculptor, a dancer, an architect, a writer, a painter, and a musician all have the ability to become an alchemist because the information went into them and out of them changing then and having as an alchemist experience a byproduct that we can call art. All other people who think they can make art without this change in them are craft makers. To work on a computer, to use a tape recorder or now a CD burner, to use a camera, to drip paint from a stick, to smear paint on a canvas with no objectivity in mind, to apply paint on a naked person and have this person role around on a canvas, to shoot paintballs at a white wall, to mark private of community property with graffiti, to fill a tank with eater and place a dead shark in it, to place a crucifix in a jar full of urine and then photograph it are all crafts and not art. If the artist does change himself while creating art and if time does honor this creator at least one hundred years after the artist has died, and if the byproduct of the artist’s alchemical process is relevant to the artist’s time and the next generation’s time that honors the art, then the creator and the created byproduct are artist and art with a capital a. So let the other artisans do their work for we do need them and the works they make. We need both Art and art. 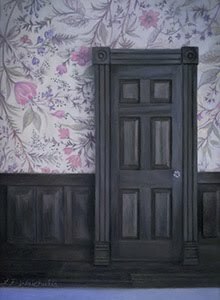 I think that Joel Carson Jones is a very real Art/Alchemist. Ricardo, thank you so much for your thoughtful post! You make some very good and interesting points. I find artwork masterful when it is able convey an experience by involving more than one sense. I believe this involves the artist interpreting not just how a certain scene physically appears, but how they feel when observing the scene, including memories that it evokes. I feel artwork by Joel Jones is successful in this regard. 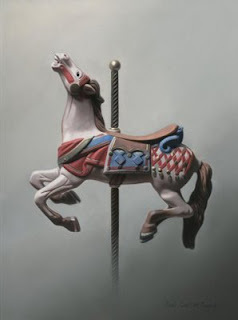 For example, the painting of the carousel horse 'Rise and Fall', to me is not just a depiction of a toy horse, but perhaps a recollection of a childhood experience. I hope you stop by and comment again.